For those of you who are new to the blog (shoutout to the new work friends! ), The Secret Recipe Club is an awesome program I’m in where every month, I’m assigned a new blogger in the program. I get to visit their site and check out some new recipes. Then, I have to make one of their recipes and blog about it! We all do the same thing and post on the same day. It is awesome to try new things and read about everyone else’s experiences! 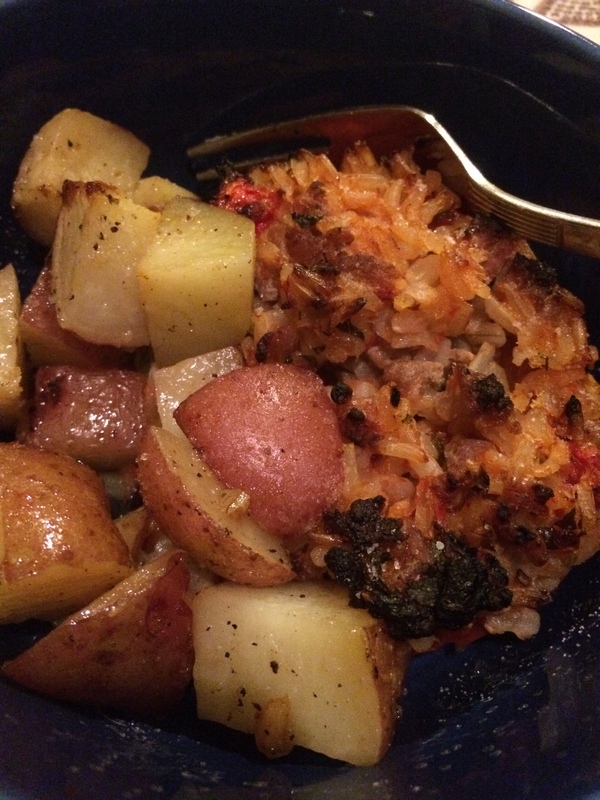 This month, I was assigned to check out Francesca’s blog, Della Cucina Povera. She is amazing! I could not decide what to make because all of her recipes sounded so yummy and also her photography is GORGEOUS. Francesca has such an interesting background which I’m sure attributes to her creative recipes… she is an Italian-Iranian-American living in Amsterdam. WOW. I’m also super jealous of all of her travels! Due to my serious decision making issues… I also tried her Carmelized Onions & Blue Cheese Pasta… holy cow it was so good! I’m also making these Lamb Meatballs next… omg. 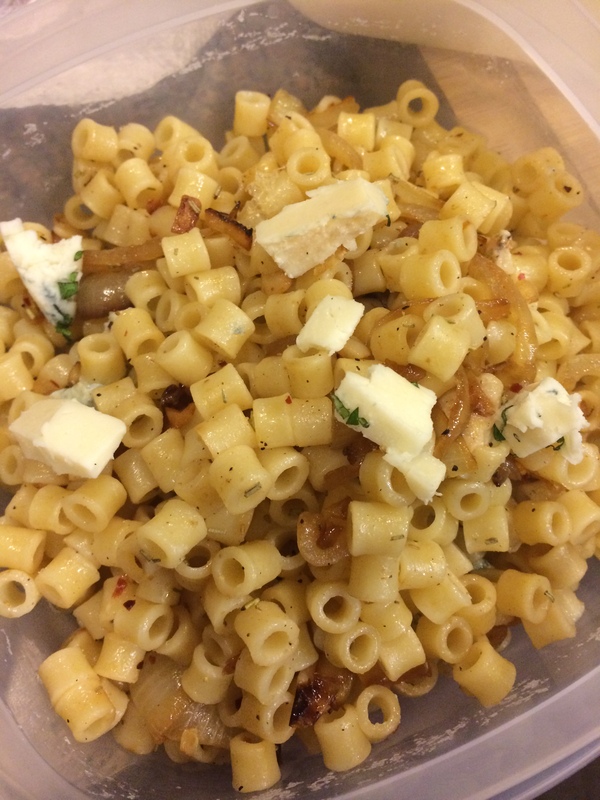 just AWESOME caramelized onions & blue cheese pasta recipe. So simple but so good. 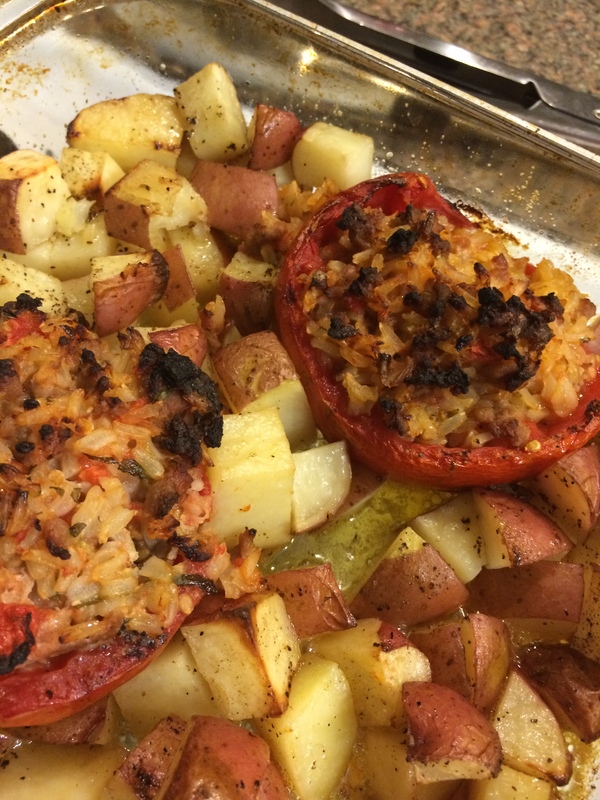 For now though, let me share with you these crazy good Greek Stuffed Tomatoes! 1. Rinse tomatoes and cut off the tops. Using a spoon, take the insides out making sure not to scoop all the way to the skin. 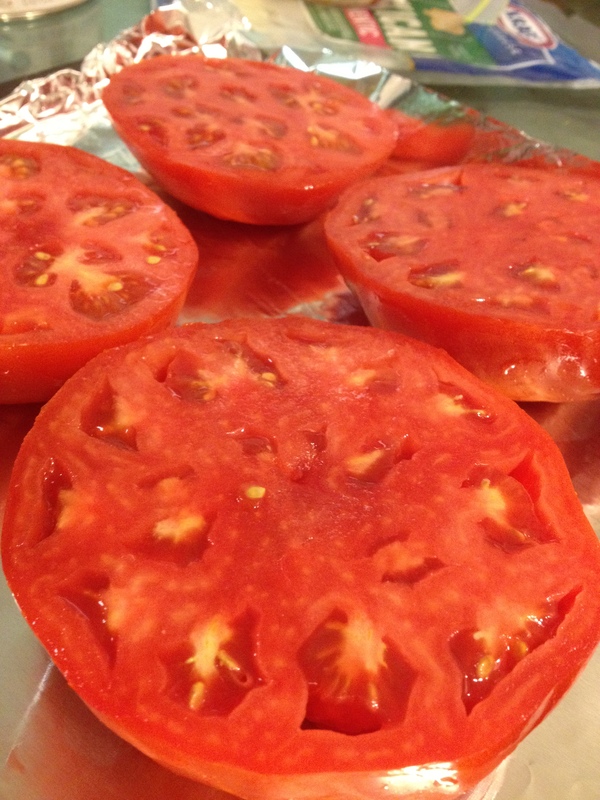 Place the tomato pulp into a foodprocessor or blender and pulse. 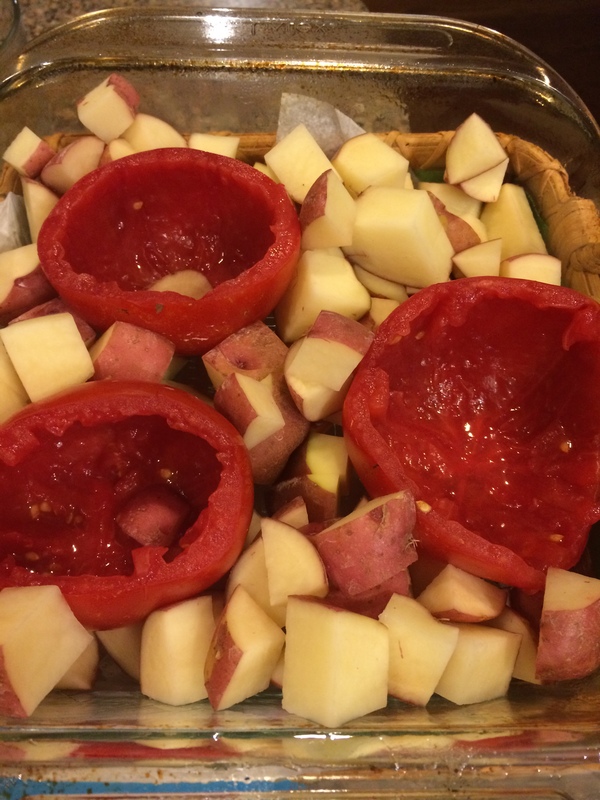 Place hollowed-out tomatoes in a baking dish and surround with potatoes. 2. Saute the grated onion in the first Tablespoon of EVOO. Add the ground meat (whatever you use) and saute, chopping. Continue until the meat is almost cooked through. 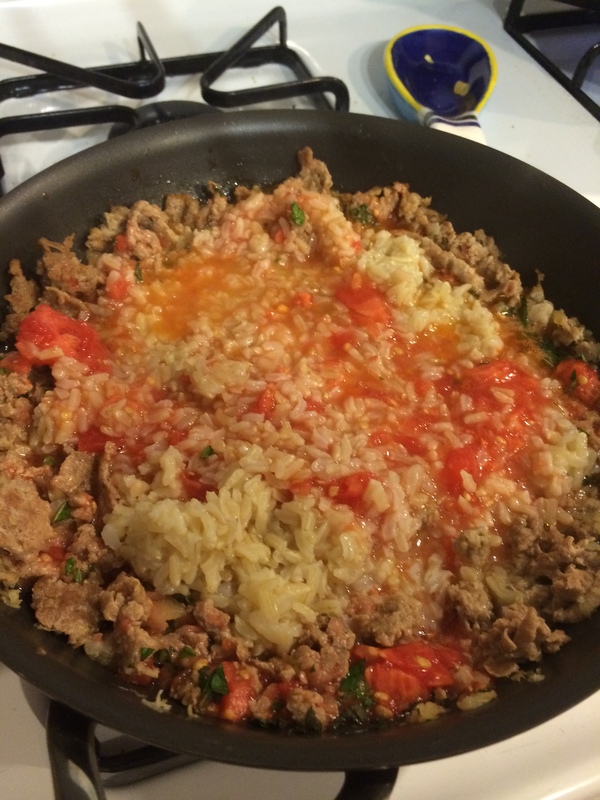 Add the tomato pulp, mint, and cooked rice to the pan. Stir and cook for a few minutes until the meat is done. 3. Turn the oven on to 400 degrees. Fill each tomato and replace the “lid”. Drizzle the remaining olive oil over the tomatoes and add salt and pepper to the potatoes. 4. Bake for about 45 min – 60 min, or until the “lids” start to brown. Stuffin’ ingredients ready to do work! Tom’s surrounded by Po’s… not too bad! The crispy, crunchy, delicious finished product! Until just a few months ago, I’ve had a pretty irrational FEAR of tomatoes. I hated…. HATED raw tomatoes to the point where they actually physically disgusted me. This past fall, I tried a grape tomato in a salad one night when I was out to dinner and I’ve been cured ever since. A few weeks ago, Dave and I traveled to Baltimore to visit our friend, who took us to the best farmers market ever (more on that soon!). We brought home the sweetest, juciest, biggest, most flavorful tomatoes EVER. We’ve been eating them in salads, pasta, eggs, and even plain. They are the best tomatoes I’ve ever had. They are what a tomato should be. Although it felt wrong to cook these special toms, I just had to have my Mom make her famous Baked Tomatoes… something I’ve missed out on my entire life! They were so fabulous. Check out the color on these babies! Put them large cut side-up on a baking sheet in foil (so the cheese doesn’t burn on your sheet! 1. 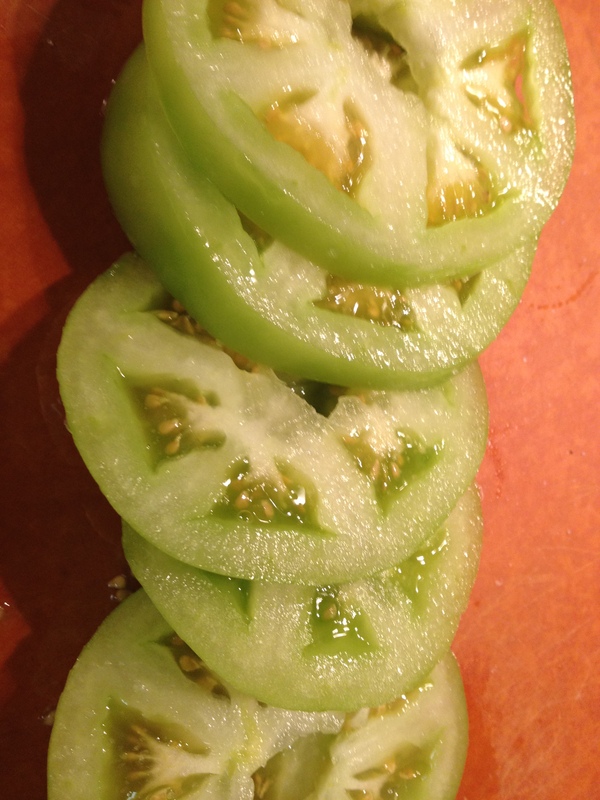 Slice off the top and bottom (where the stem was) of the tomato, without removing very much. This is just to create a flat surface. Now slice each tomato in half, by width. 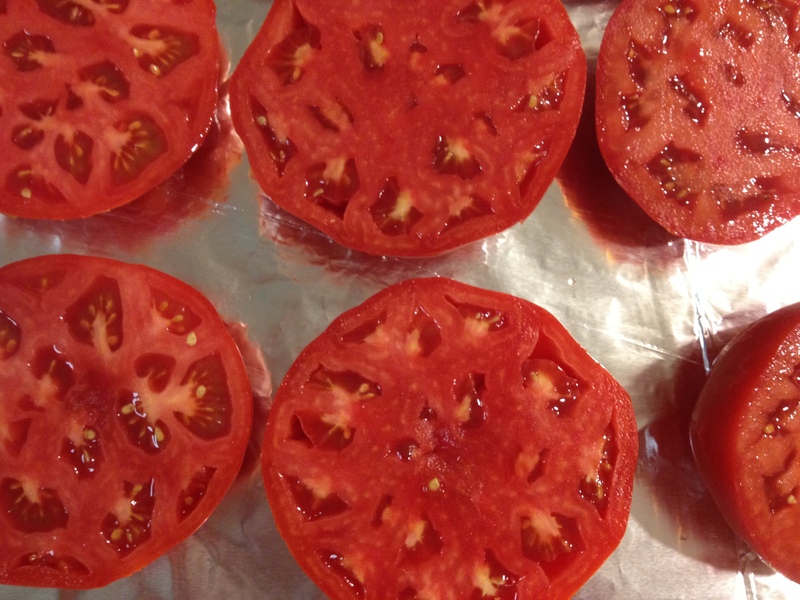 Stick the tomatoes, large cut-side up on a foil lined baking sheet. 2. Season the tomatoes with salt & pepper. 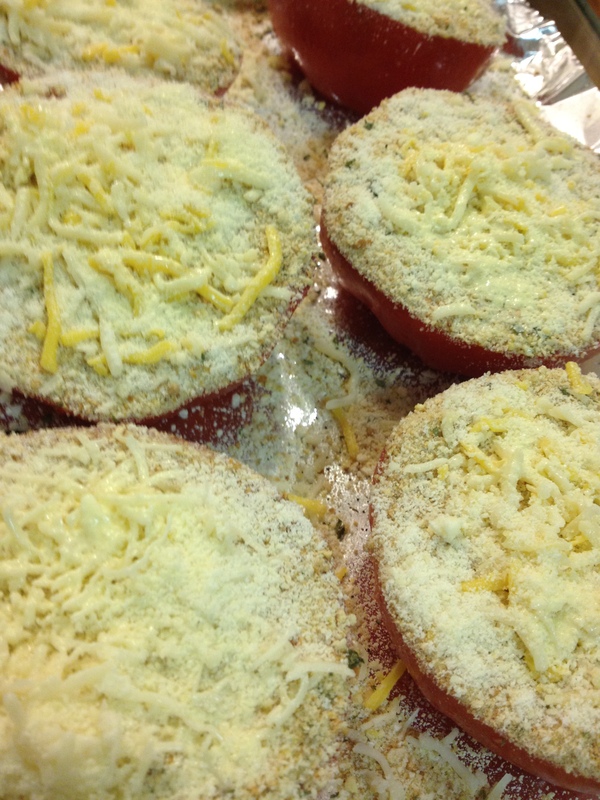 Spread 1 Tablespoon of bread crumbs onto the top of the tomato. Lightly spray the breadcrumbs with the oil or butter. You don’t need much. Now, spread the shredded cheese ontop, then the parmesan cheese. Season again. 3. Stick them into an oven preheated to 400 degrees. Bake until lightly browned ontop. 4. Let cool before you eat them. They’re going to be super hot inside! Wegmans just opened up in King of Prussia. We have a new Wegmans!!!!!!!! YAYYYYY! I have been a little bit addicted to shopping at Wegmans since we first visited the new location last month. I cannot stop raving about their fabulous produce. Giant boxes of blueberries, $4.99… same with Raspberries. Locally farmed Zucchini and Squash. So many types of melon you haven’t even heard of. Pick your own green beans. YUM! 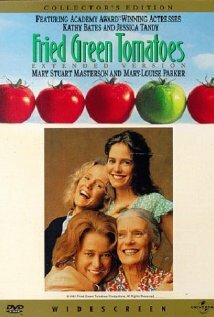 When I spotted Green Tomatoes, I was inspired. 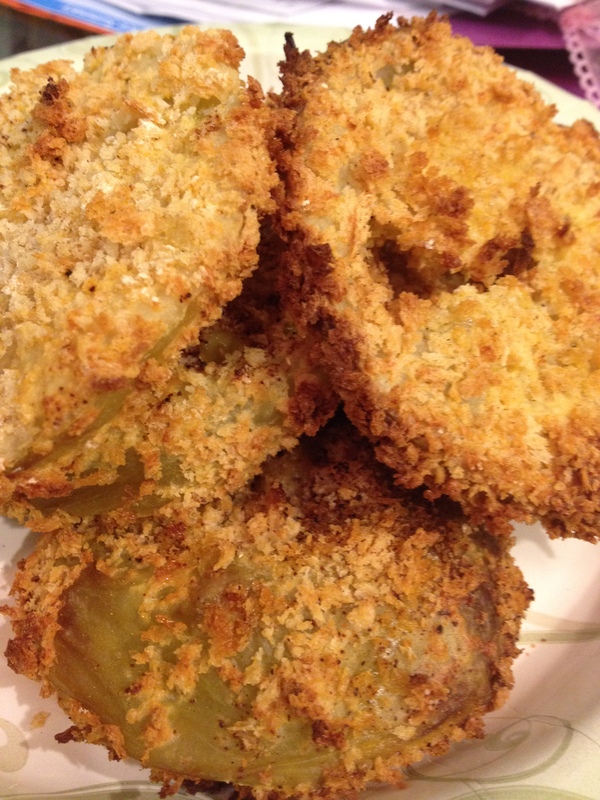 I had to try fried green tomatoes… you know… now that I don’t hate tomatoes and all. 1. Combine a pinch of Salt, Pepper, and Garlic Powder into the flour. Place the flour, egg beaters, and bread crumbs into 3 separate bowls/plates. Preheat the oven to 400. 2. 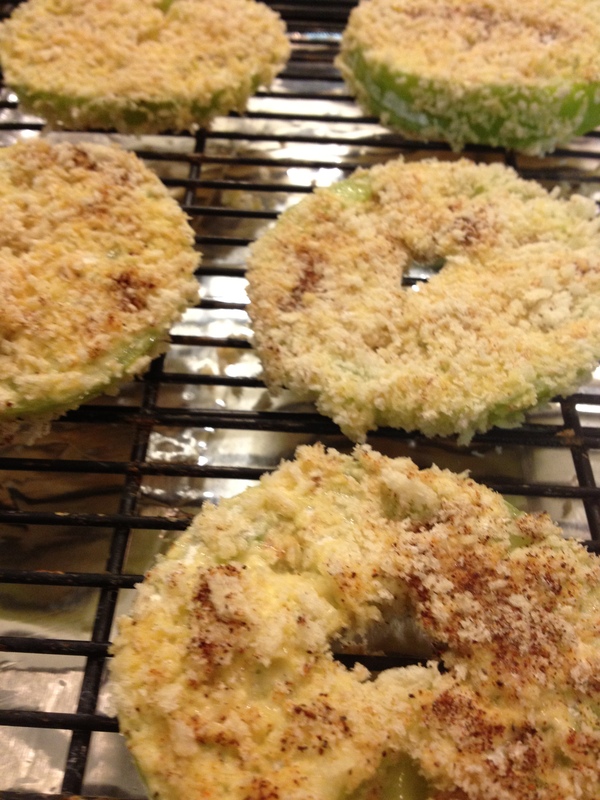 Dredge the tomato slices one at a time, first in the flour, then in the egg, then in the bread crumbs. You may have to press the Panko crumbs down onto the slices to make them stick. Sprinkle with Cayenne Pepper if you’d like, and Paprika. 3. 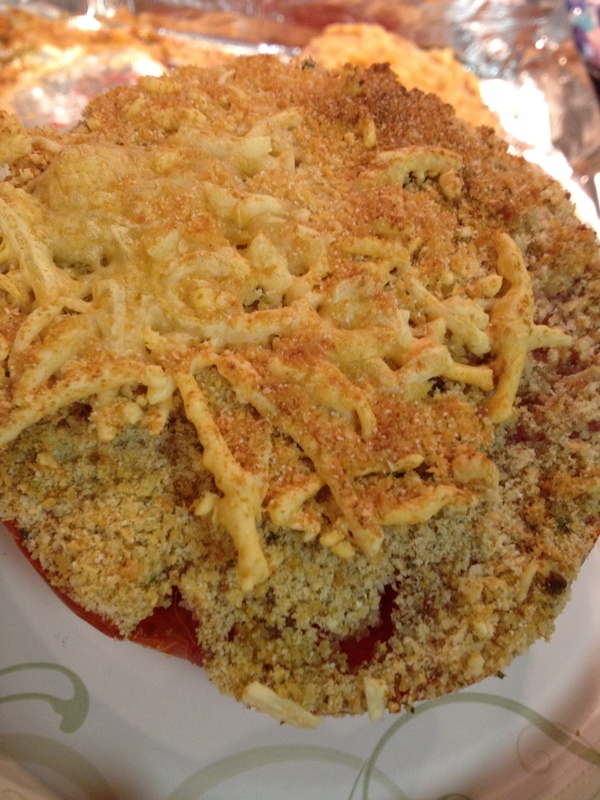 Place the breaded slices of tomato onto a rack on a baking sheet. The rack will keep the tomatoes from becoming soggy when you bake them. Bake the tomatoes, checking and flipping them every ten minutes until they are crispy and starting to lightly brown. 4. Remove from the oven and enjoy! Dip in any sauce… ketchup, ranch, etc. My Mom and I both thought these reminded us of fried Pickles?! Weird! They were so delish, and were a nice treat without being overly un-healthy. You definitely don’t miss the frying of these… the panko combined with using the rack keep the tomatoes super crunchy and crispy. I can’t wait to make them again! Before baking… see the rack? It’s clutch! I used a baking sheet covered in foil underneath for easy cleaning.